The Barents Sea is one of the four most important fishing grounds in the world. For hundreds of years the Magerøya Island has been important for the fishermen. However, these days of globalization and industrialization fishing canneries are for the most part becoming bigger and fewer. Today, tourism has become a more important business in Skarsvåg. Avid hobby fishermen travel to this fishing heaven from all over the world to catch cod and halibut. A vital part of the harbour is the breakwaters that were finished in 1982. Mrs Santa is located in the village. People on their way to Nordkapp, stop by to get a photo taken or taste some Christmasy waffles. In the autumn of 1944 every building was burned to the ground as WWII was coming to an end. The rebuilding of Skarsvåg after the war included only one type of residential houses. The government implemented a standard type of house. The houses were supposed to be warm ,effective and quick to build. Despite a goal to have it done by 1951, the post-war reconstruction of Skarsvåg wasn’t completed until 1960. Some of these houses are still standing. The colorful houses in Skarsvåg, as in many places of the north, are the result of people expressing their sense of independence. This custom persists to this day. The chapel was also built after WWII. The first modern tourist travelers came to Nordkapp as early as the 1870s. Skarsvåg is a little influenced by its visitors. For many decades, Skarsvåg was essential to the North Cape tourist. It was the port of call for the cruise ships, and the base camp for the final ascent to the famous plateau. In the beginning, the locals would bring travelers from Skarsvåg to a small bay Hornvika in their small boats. From Hornvika, the travelers would climb to the top of the plateau, 307 meters above sea level. Influenced by tourism, the people tended their little gardens. Skarsvåg has some presentable gardens in spite of the sub-arctic climate. The new road from Honningsvåg to North Cape in 1956 changed the role of Skarsvåg. Honningsvåg became the hub of North Cape tourism. Today, Skarsvåg is a highly recommended starting point for experiencing the area. Good housing opportunities, great local dining and a few natural excursions on hand. You can pay the North Cape plateau, the Christmas house, and the birds in Gjesvær a visit. For recreation purposes, the obvious hikes would be to do Knivskjelodden or Kirkeporten (picture). 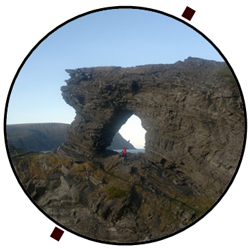 The easiest, Kirkeporten, is a special rock formation and an ancient sacrificial site of the Sami people. From this site you are blessed with a view to the famous Nordkapphorn. There are other great opportunities besides Nordkapp and Skarsvåg. What do you recommend on the Magerøya Island?